Problematic labor replacement by eliminating repetitive motion risks, while allowing the stacking of squad and stable loads to full height, minimizing freight costs. 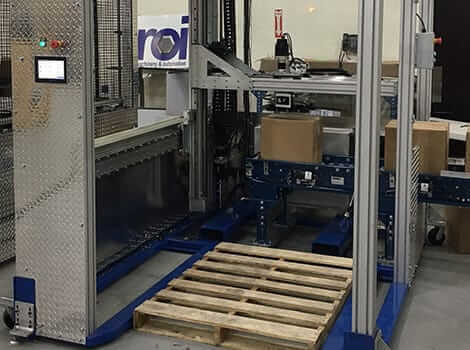 A compact, mobile footprint fits into your existing tight spaces, typically not taking up any more space than what is currently being used for manual palletizing. 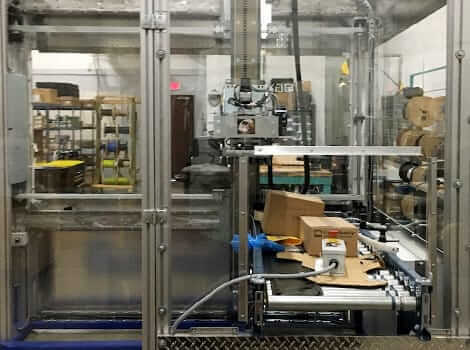 Production line reconfiguration is not required when implementing a PALLETPOD. Modular flexibility dramatically shortens physical effort and project times for customers, significantly reducing customers’ use of technical resources. Immediately lower costs with a PALLETPOD lease or rental option. Online placement between shifts with limited operational disruption. Get two-hour initial installation time and 30 minutes of training. When it comes to running a functional process, you need equipment that can get the job done. No more wasting time with machinery that has a single function, taking up more floor space and capital. Cost-inefficient manual labor that allows injury, paid time off (PTO), and other factors to compromise productivity. Spacing issues, including a machine-dense workspace that prohibits workflow and causes accidents. Slow production times stemming from outdated machinery performing specific functions. Make sure that you’re getting the most out of your machinery with an accommodating suite of options from PALLETPOD. Reach out to ROI today, and find out how we can revolutionize the workflow for your plant. In a little over a decade, ROI has served over 100 customers with exceptional care and attention to detail. Find out why so many companies trust our team to deliver high-quality technology that streamlines productivity and maintain high safety standards, all while keeping operating costs affordable.